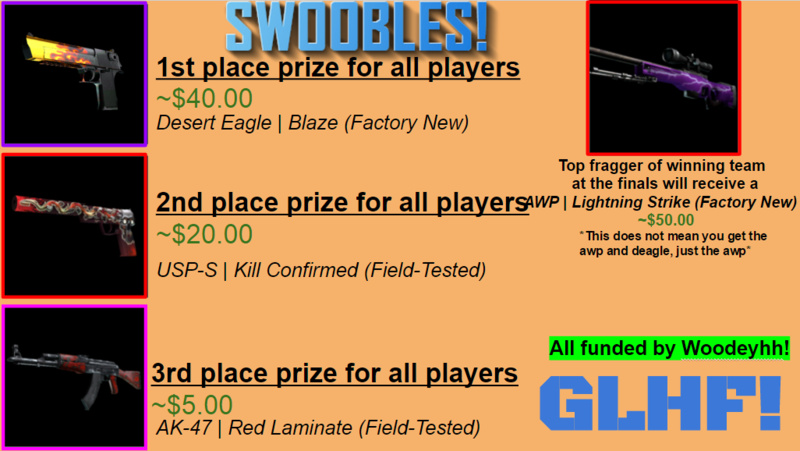 Swoobles will be hosting a competitive tournament. Premade teams are strongly encouraged, however single participants will be allowed to enter as well. They will be placed on a team with other players who entered the tournament alone. As a result of this, if there are not enough solo entries you may be placed a substitute. In order to enter, you must have 45 global hours on Swoobles to prevent entries from non-Swoobles players. Any forms of cheating (as well as griefing, throwing, and ghosting) will result in immediate disqualification for your entire team and punishment according to the Swoobles rules. Private Teamspeak channels will be provided to the two competing teams if requested. This tournament will be a double elimination (meaning there is a loser’s bracket). Every game will be a best of one, aside from the loser’s bracket final, semi-final, and the final games. These three matches will be a best of three. This can be seen in this example bracket (this is just an example of how this bracket will look, there is no set number of teams). The deadline for entering your premade team is March 5th, while all solo entries must be submitted by March 1st. However, the tournament will not start until after this time. Please keep all responses to this thread as entries for the tournament. For questions regarding the tournament, see this thread. We are still looking for players to stream and/or cast the tournament. Level 3 admins who are willing to watch the tournament games for cheaters will also be necessary. Please PM Nic on Steam if you are interested in either of these tasks. Thank you Woodeyhh for providing the skin prizes to this tournament! Thank you as well to Pavlo, m0nster, and TrippiN for helping organize the tournament, and ArmyJackz for helping create this post. Team name: 4 Admins and the other one.